Silver Dollars are US money – Congress says so. In previous articles, we’ve discussed how to incorporate them into everyday commerce, allowing you to buy (POS) and sell (Invoicing) things, pay salaries (Payroll), and handle most ordinary transactions (Bill Pay) using Silver Dollars. We’ve seen how you can use an Account to safeguard your Silver Dollars, while allowing you to deposit more and to make withdrawals. Today, we’ll look at how you can make investments denominated in Silver Dollars. Suppose that you wanted to buy 100 shares of IBM. You could open an account at a brokerage house, deposit sufficient funds in Paper Dollars, and then instruct them – as your agent – to buy the shares for you. They would handle the transaction, billing your Paper Dollar account, and keep your shares in their name for you. But, if you want the purchase, and/or later sale, transacted and accounted for in Silver Dollars, they cant help you. They just are not set up to work with Silver Dollars. Now, Cambi is not a stock broker – just as we are not a bank. But, what we can do is order an item you desire, purchase it ourselves, and then resell it to you. We would add on a small profit, rather than the commission that a broker would charge. This is just as any merchant would do for any item that you would care to special order. Yesterday, the Department of Labor unexpectedly issued a new rule (which it called an interpretation) that will upend thousands of businesses’ established practices. It did so with no notice, and no comment by affected businesses is either sought or allowed. Effectively, the administration is now ruling by decree. The “administrator’s interpretation” is about an obscure categorization of employment called “joint employer.” Such a situation arises when two or more employers are jointly responsible and liable for a worker’s employment conditions. Over the past 40 years or so, new business practices have arisen whereby firms contract out or franchise parts of their business. The Department of Labor (and the National Labor Relations Board) have allowed this, treating the businesses as separate and the employees as having one employer. That is all changing very quickly. The ‘Anthropocene‘ is a term widely used since its coining by Paul Crutzen and Eugene Stoermer in 2000 to denote the present time interval, in which many geologically significant conditions and processes are profoundly altered by human activities. – The Adjustocene, where no one will ever know what the temperature is. Georgia has become the latest in a long line of states looking to reform its civil asset forfeiture program. A growing number of people are apparently waking up to the common sense idea that the government shouldn’t seize private property from people when they haven’t been convicted of – or even charged with – a crime. State Representative Scot Turner has introduced an extremely simple piece of legislation that would, with a single line change, effectively end the practice of civil forfeiture in his state. Turner’s bill makes mandatory the formerly optional ability of courts to suspend forfeiture during an ongoing trial. In other words, the government wouldn’t be allowed to take your stuff without convicting you. Recently a large number of states have embraced the idea of forfeiture reform, and while only a couple have successfully passed legislation, it’s notable that Oklahoma, Pennsylvania, Wisconsin, Florida, and others are all talking about the policy’s flaws and the need for change. Several senators want to advance a massive energy bill called the Energy Policy Modernization Act of 2015. But there’s nothing modern about the legislation. The bill is an extension of the same, tired “politicians know best” mentality that siphons taxpayer dollars and hands them to special interests. The policy provisions of bills like this take decisions away from households and businesses and only empower Washington, D.C. The legislation, which totals more than 400 pages, allegedly attempts to avoid controversial provisions that would cause partisan divide. But the bill is full of provisions that should be cause for concern for American taxpayers. Charts With More Words Than COMEX Has Registered (Gold) Ounces! A reader recently sent me these charts. 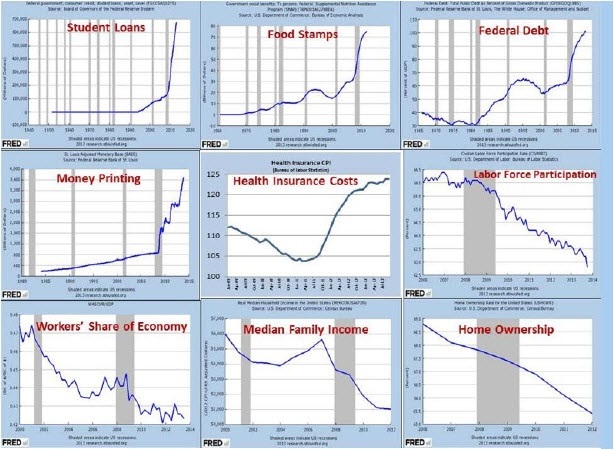 I do not know who put this collection together to give credit to but I do want to say these charts pretty much tell the WHOLE STORY! Please note each graph has grey shaded areas which identify recessions. What we need to focus on is what has happened since the last “official” recession of 2008/2009. I put the word official in quotation marks because it is clear something has gone very wrong since 2009, have we really recovered?